Some of you asked about Jose's headgear. It's a short-shanked mechanical S hackamore. (And this depends on who you talk to... some say this is not a true 'mechanical' hackamore). 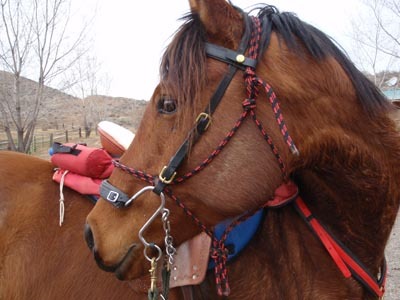 A hackamore uses leverage and pressure to get a response. It's designed, when you pull on both reins, to put pressure on the horse's nose (the noseband), the underside of the jaw (the chain), and the poll. You don't get communication with a hackamore like you do a bit, however. A hackamore is for control, not communication. If you can ride on a loose rein, and only need direct (vertical) pressure to slow down or stop, a hackamore may be for you and your horse. It doesn't work well for lateral steering. This 'short-shanked' S-hackamore Jose is wearing is a less severe hackamore... but any piece of headgear, bit or hackamore, can be severe with heavy hands - just as a harsher bit or hackamore can be kind with light hands. If you're a person who rides with contact, i.e. on the horse's mouth all the time, your horse will learn to brace against the hackamore - and learn to ignore it or run away from the constant pressure, or stick his neck in the air. (Of course, he'll do that with a bit, too.) And as always, you shouldn't be riding with just your hands anyway. Don't forget you also have legs and a seat. Jose's noseband is a kind, flat one, and I keep the jaw chain fairly loose. Jose isn't normally a puller - unless he's on loop 1 or 2 of an endurance ride - in which case I start out with a bit, and change to the hackamore on loop 2 or 3! The reason I use this hackamore is because this is what we have on hand, and Jose goes well in it. On Stormy I use a sidepull. I haven't tried a bitless bridle. If you want to try a hackamore, be sure you try it out in a controlled environment until your horse gets used to it. In other words, don't toss one on for the first time and canter to the starting line of a 50-mile ride expecting your horse to understand it and respond to it immediately, as it will feel different to him and he'll have to get used to the new 'communication' and pressure points. 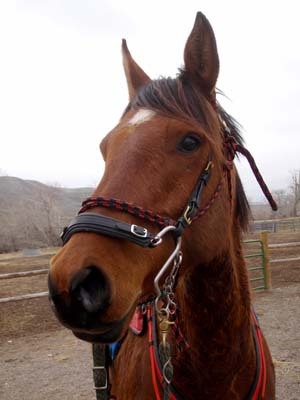 Best reason for using a hackamore is that the horse can eat and drink easily on the trail. Best reason for Jose is that he hates a bit! Merri, what headstall are you using? Is it specifically made for a hackamore or just a normal add-on headstall. I've been looking for a halter/bridle combo to work with my s-hack (so I can remove the hackamore at vet checks); I can't get my current add-on headstall adjusted short enough for it to work. Slide your hand under the S on the near side, then pull on the rein. You think you are cueing your horse to turn left, but the top of the S digs into his cheek at a particularly sensitive place over his teeth and pushes his head to the right.The result can be head tossing, pain and resentment as the top of the S hurts where it digs in. It works okay if you only pull back. Karen, this headstall is a normal one you can add the hackamore or a bit to. It's similar to this one at Griffin's Tack - and Henry can always make it to fit. The one I'm using has has button snaps to go around the halter at the top instead of these 'hook' snaps. But either are easy and fast to take on and off, really convenient. Heidi, I will try that next time I ride Jose. And Pam, I don't know about the Vosal - haven't ever used one. I use the Sportack vosal and love it. Have one for each of my mares now.